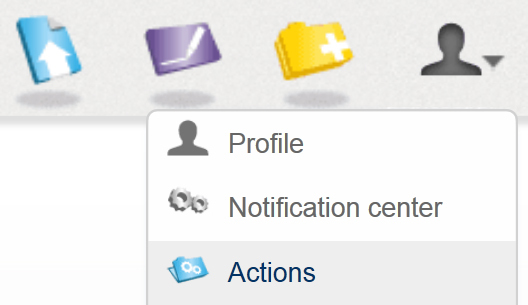 Our new Actions feature is available in the drop-down options under your Portal user menu (see screenshot). The Actions option provides you with a fast and convenient overview of your recent Portal activity and history. In a single view, you can quickly review when you uploaded files into particular folders or see when you sent or received messages and where you may have filed message attachments. With the new Versions feature, the SecSign Portal enables you to view all previous versions of a document. When viewing folders or files in the Portal, you will see the latest version by default. However, when you upload files or folders using the new Versions feature, you now have the option to see a small number to the left of the folder or file name, and this indicates the number of versions that have been uploaded and saved to the Portal. If you click on the number, you will be shown the list of available versions (see screenshot). To use this feature, simply upload a new folder or file as usual. You will then be asked if this is a new version of the document. After your confirmation, the new version will be added accordingly (see screenshot). Our new Viewer feature lets you view all PDFs, images, videos, and similar files without having to download them first. Just click on the ‘eye’ symbol, which appears when you hover your mouse over a specific document (see screenshot). Click on the eye symbol and the PDF, image, or video will open immediately. The Portal’s powerful sharing and organizational tools are easily accessible from within the Viewer screen. You can use the convenient icons located in the top left of your Viewer screen to download the selected file, share it, send it as an attachment in a message, or add a note to it (see screenshot). It can’t be any easier! While working in the Portal, you can use the new Reload feature in order to update your views and quickly check whether you have received a new message or whether a folder or file has been uploaded. 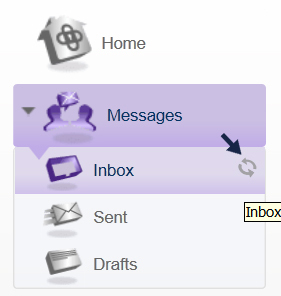 To reload one of your messaging mailboxes, your folders overview, or a specific folder, simply click on the reload icon to the right of the respective item (see screenshot) and you will be immediately updated.